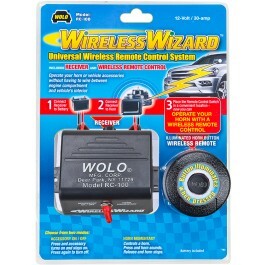 Wolo’s new WIRELESS WIZARD allows the user to operate a vehicle’s horn or control any 12-volt accessory, such as warning lights on and off, without having to wire between the engine compartment and the vehicle’s interior. 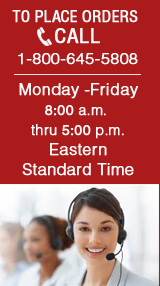 The Wireless Wizard is built with state-of-the-art electronics, assuring years of reliable service. Every WIRELESS WIZARD has its own coded transmitter to prevent interference with similar remote control systems. Wireless Wizard is easy-to-install to any 12-volt car, truck, ATV, boats and industrial equipment, without any special tools and without drilling of holes. The remote transmitter mounts with Velcro® in a convenient, easy to reach location, and is powered by a 23a type battery, which is included in kit. The remote’s push button will illuminate blue when pressed; alerting the user that coded RF signal is being transmitted to the receiver to turn on. The case of the remote transmitter has an attractive black leather grain finish to match the interior of most vehicles. Instructions in English/Spanish. IMPORTANT: before mounting the remote transmitter, always reference vehicle’s manual, never mount the remote transmitter in the air bag deployment area.